Jeddah: A new English biography of Prophet Muhammad (peace be upon him), titled "The Soul of the Desert" has been published in an epic but fascinating form, narrating the life of the last Messenger of God from his birth to death. Written by Umer Thasneem, assistant professor of English at the Teachers College of King Saud University in Riyadh, the book has been brought out by Other Books in India, which specializes in the publication of religious and philosophical titles. The Prophet and the men and women around him have been sketched so vividly that it will add to the understanding and pondering about a great life and the people, landscape and belief influenced by that life. The book will not only help counter the smear campaign against the Prophet but also encourage young readers to memorize and internalize the life of the messenger. Its lyrical quality is seen in the titles to the thirty odd chapters. The last section of the book is a compendium of the Prophet' sayings, highlighting the humanist and pacifist nature of his noble mission. "For Surayya, it was the luminous presence of the Prophet even after his physical death that made the world a livable place, which would have otherwise been nothing but an uninhabitable desert," Thasneem said. "The title of the book, 'The Soul of the Desert,' in this sense is suggestive," he added. Being a graduate of the London School of Economics and having worked under celebrated sociologist and music critic Paul Gilroy, Thasneem feels that more needs to be done to promote reading habits among Saudi students. With his poetic attempts, he hopes to do his own bit to foster his students' literary sensibility and aptitude for reading. Writer and cultural critic Ziauddin Sardar described the poetic portrait of the Prophet’s life as “an inspiring and heart-warming” work. According to Prof. Ahmed Ilyaas Vilayathullah, the author's colleague at the Riyadh college, the book will serve the twin purposes of boosting students' English abilities and reinforcing their spiritual orientation. “It will also help grown-ups as well, since it throws light on various aspects and episodes of the 'gem of the desert' in simple words," said Vilayathullah. What is the 2G spectrum scam about? 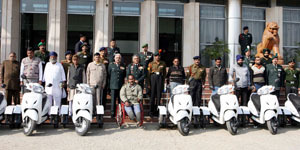 Gen VK Singh, COAS with the disabled soldiers during the presentation ceremony of specially modified scooters to disabled soldiers, financial assistance and education scholarships to Veer Naris and their wards, in New Delhi on December 15, 2010. The Indian Army has decided to observe 2011 as the year for its disabled personnel to honour the soldiers who have been rendered handicapped while serving the nation.